Hello and Welcome to the A. Reid’s Social Studies website and online companion to the course—the only school website dedicated solely to the social studies students currently Paul W. Bell Middle School. In addition to making social studies more interesting and engaging, the aim of this website is to give our students greater possibility to facilitate their own learning and gain the best possible chance for academic success. In all the site should serve as a value information source for both students and parents. This latest edition to the Online Companion to A. Reid Social Studies has a new design aimed at catering to needs of 6th, 7th, and 8th grade students. It features greater access to the course materials by both grade level and by semester quarter. The Introduction page contains links and information pertinent to students from all three grade levels. The page also contains links to each of the grade level Courses, which specifically contain sources, links, and information pertaining to the corresponding course. 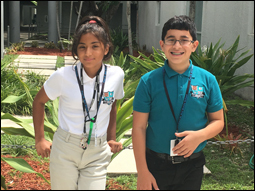 Web server space for this site has been provided thanks to the Forever Bloom Alliance, a Paul W. Bell Middle School Dade Partner since 2010.